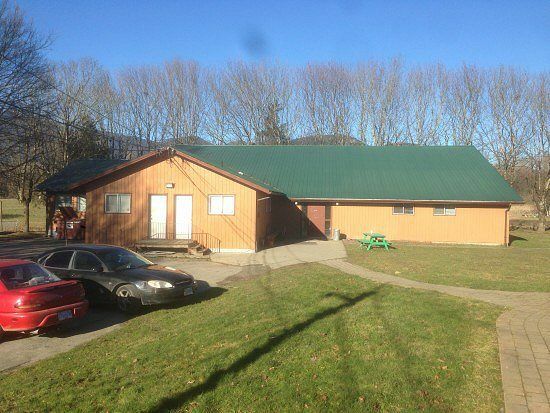 Located at 619 Wellington Ave , the Band Hall can hold up to 150 people comfortably and has a large kitchen complete with two stoves, sinks, refrigerators and a microwave. Dishes and cutlery are limited and members are encouraged to bring their own. Arrangements can be made to have tables and chairs set up before an event, please specify on your rental agreement in the special instructions section. Applicant is responsible for reading all information and for complying with all rules and regulations. The individual signing the Rental Application and Agreement personally guarantees the obligations of the organization or group using the Hall / Office. A $100 Damage Deposit is required with this application. Damage deposit will be returned only after inspection of hall results in no discovery of damage or missing items. Skwah First Nation is not responsible for claims for personal injury, or for damage to or loss of property relating to rental of or occurring on Band Hall / Office property. Individuals or organizations granted use of the Hall / Office agree to be responsible for any loss or damage caused by such use and agree to indemnify, defend, protect and hold the Skwah First Nation harmless from all claims and damages arising from their use of the Hall. No smoking, fires, or open flame allowed in Hall / Office or surrounding property. No animals allowed in Hall / Office. No alcohol allowed in Hall / Office. No use of confetti, rice or birdseed in Hall / Office or surrounding grounds. Applicant may not store items in the Hall / Office prior to event. Items left for more than 14 days after an event will be considered abandoned and shall become the sole property of Skwah First Nation, which will be free to dispose of any such items as it sees fit. On the date of the event, the Hall / Office will be opened and closed by a representative of the Skwah First Nation. This representative shall have access to the facility at all times and shall not be excluded for any reason. NO KEYS WILL BE GIVEN OUT. Hall capacity is 150 people. Office capacity is 50 people. Hall / Office must be left in a clean and tidy state, Not doing so will result in the damage deposit not being returned.